Collecting coins is not only very entertaining, it can be a very lucrative hobby too. If you can get your hands on rare coins or build a killer coin collection, there is no reason you can’t sell your work for a decent amount of money. Of course, a lot of people collect coin just as their hobby without having any intention of selling their collections. Those who are into this kind of hobby should take time to keep up with the developments in this field. That’s what Coin World for iPad is for. It is an awesome magazine that covers all kinds of useful information on money, coin, and other collectibles. Coin World provides you with the current retail value of coins in the U.S. It covers over 65K coins, so it can be a good place to start your journey in the coin world. 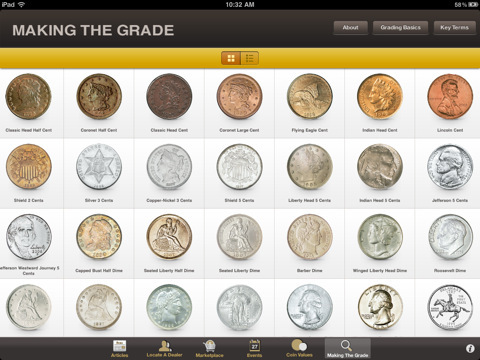 It does include guides on ways you can determine your coins’ grade and value. Going through this app’s coin database is pretty straight forward. Just choose your denomination and design to get the information you need. Want to sell or buy coins? The marketplace within this application gives you a quick way to do just that. 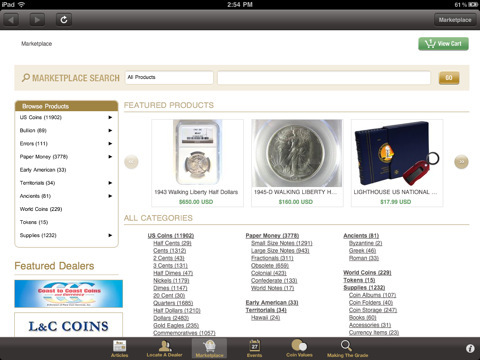 Coin World for iPad does keep you up to date with the latest news in the coin world. It is not something you can’t find online but this app makes finding this information very convenient. If you don’t know your way around coins or just need someone who knows much more than you do, you can always find a specialist or dealer in Coin World. It covers coin events in your area too! 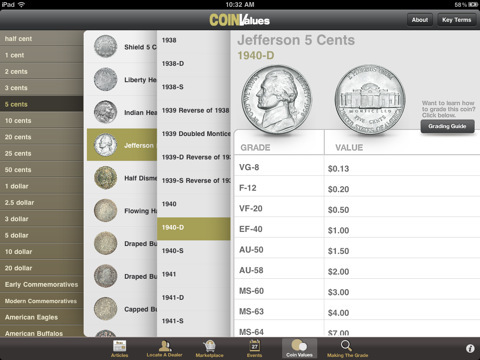 Coin World for iPad is a powerful free tool for anyone in love with coins. It has a ton of useful information on this field and can save you time looking up your coins and their values. 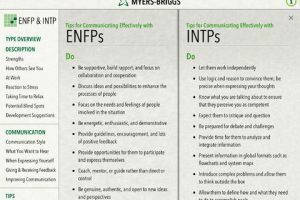 It is free at the point of this writing (with in-app purchases available). How would you improve Coin World?